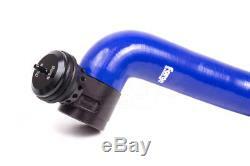 Seat Ibiza 1.0 TSI Forge Dump Valve Kit - PN: FMDV9. This valve kit allows the fitment of a fast response blow off valve on the 1.0 TSi engine with the engine code PR-TJ4. As the engine does not have a diverter valve fitted as standard, Forge Motorsport have developed a twin piston dump valve that not only gives you an incredibly loud sound when lifting off the throttle but it also increases the throttle response during gear changes by reducing turbo lag, it is designed to help the turbocharger maintain its rotational speed ready for when you accelerate. 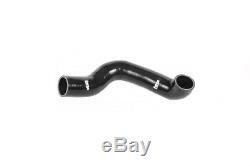 Due to the exposed position of the OEM boost pipe and the nature of an engines heat cycle the plastic the OEM pipe is made from can deteriorate over time becoming brittle and susceptible to boost leaks. 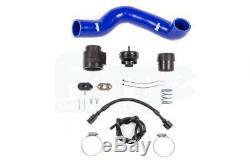 This kit totally replaces this plastic pipe from turbo to manifold with a silicon hose (available in a choice of colours), and everything else you need to install the valve is included in the kit together with full instructions. Anodised CNC machined billet couplers and components along with a tuneable CNC machined twin piston Forge Motorsport valve. Custom colours are available but will incur a 50% none refundable deposit and a lead time of 8-10 weeks. Unlike other valves on the market the Forge valve will not bring on any check engine lights. The Forge silicone hoses in this kit have been designed to include an expensive inner liner of modified silicone known as Fluorosilicone. This ensures the colour of the silicon hose stays bright and vibrant and unlike our competitors will not deteriorate over time. This means Forge Motorsport hoses are suitable to be used with modern long-life coolants, Organic Acid Technology coolants O. The construction of the hose has been engineered to exceed that of the OEM fitments, the Forge Motorsport hose will enhance any engine bay both technically and aesthetically. The use of a Fluorosilicone liner ensures that Forge silicone hoses are the clear market leader. This Forge valve set up is designed to fit with both the standard intake and the Forge Motorsport intake. We cannot guarantee that this product will fit with all aftermarket intakes. 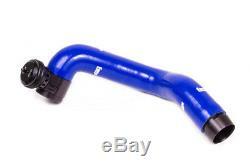 1x Forge Motorsport Atmospheric Dump Valve. 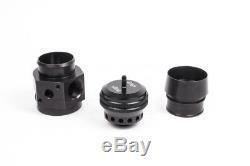 1x Boost Tap / Take Off (Including Cork Gasket and Screws). 1x Throttle Body Coupler with Dump Valve Thread. 1x Silicone Hose (Red, Blue or Black). 1x Roll of Vacuum Tubing. Forge Motorsport was founded in 1994 with the simple ideals of innovation, clever design, and manufacturing to the highest quality. Their mantra is the BEST customer care and after service worldwide. In doing this they have developed the largest range of replacement aftermarket blow off / recirculation valves, intercoolers and actuators in the world. We try to respond to messages within 24 hours. If you do not receive a response within 24 hours please send us another message. Upon receipt of your order you will be asked to sign for the goods received in good condition. The item "Seat Ibiza 1.0 TSI Forge Dump Valve Kit PN FMDV9" is in sale since Thursday, December 21, 2017. This item is in the category "Home, Furniture & DIY\DIY Materials\Plumbing". The seller is "wg_motorparts" and is located in Rochester.